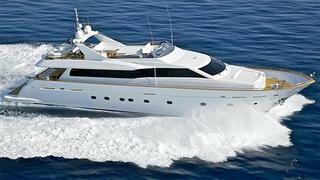 A conversation with Nikos Odysseas Papadakis brings news that he's listed a 30.48m Tecnomar 100 for sale. Launched in 2009, the Tecnomar 100 accommodates up to 12 guests in a master suite, VIP stateroom, a double cabin and two twins with Pullman berths suitable for children. Twin 2000hp MTU engines give her a comfortable cruising speed of 26 knots and, available to view in the Eastern Mediterranean, the Tecnomar 100 is asking €3.4 million.